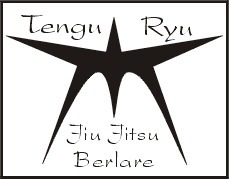 The original trial-logo shows a symbol representing the multiplicity of Jiu Jitsu. The type of character used is President. This preliminary design was never put to actual use, with the exception of one stamp. The symbol has nevertheless been adopted by the creator as his personal brand. 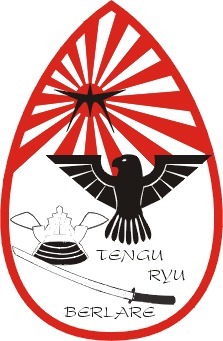 This design is the first that has been used to symbolise the Tengu Ryu club. The first occurrence was a badge still worn to the present day by all training members on the left side of their kimono. Obviously the club still has a abundant supply of these badges. The Multiplicity-symbol returns smaller, but items have been added to give the logo a more original look. 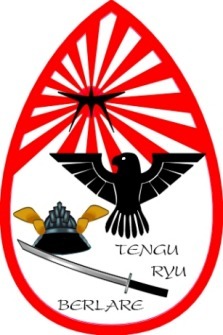 The Tengu-bird with 7 tailfeathers to symbolize the philosophy of Jiu Jitsu, respect for nature and to indicate that this discipline is a modern adaptation of the original Art of Self Defense, very close to the original Yawara-techniques used long ago in Japan. The Japanese helmet and Katana are a tribute to Ken-Jitsu, which is the origin of Jiu Jitsu. The Japanese Red Sun with its warlike rays are actually in contrast with the basic Jiu-Jitsu idea that "a fight avoided is a fight won". Some 6 years ago the original badge was altered towards a prettier and pseudo-modern look. It was basically used as a letterhead for more important correspondence, and for publicity purposes. Not very well suited for letterheads and the like, the logo was quickly adapted to a true modern look. The helmet disappears, but the Katana, symbolising the samourai, remains. The rays, as found in the Japanese WWII flag, disappear. The rising sun remains. 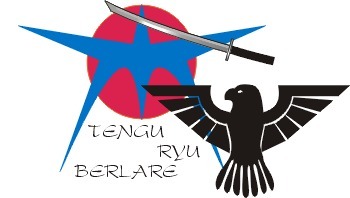 The Multifacet-symbol turns blue in contrast to the black Tengu, obviously for esthetic reasons. In 2015 a new badge was designed with a more modern look. It was a necessary replacement since the original stock of 500 badges was completely gone.